Glass packs are an excellent way to get a sample of different styles and colors of glass for an affordable price! Pictures are only a sample of the glass color. Your pack may contain different, yet just as pretty, colors! Also, due to the nature of how glass is made and the different variations in computer monitors, the actual color may vary when viewed in person! Since UPS now prices shipping by the size of the box, it pays to get 2 or 3 glass pack to fill the box. Get the most bang for your shipping buck by not letting the box ship with room to spare. You can add glass from any part of this site. and anything else that makes you want to hop on a surf board and grab some tasty waves, dude. Only $5.99 $4.99 for over a square foot of glass! Glass in picture is a representation of the glass in the pack. 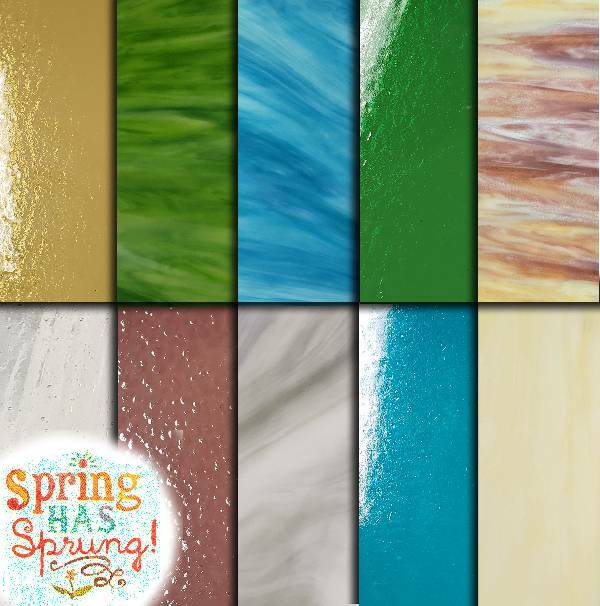 Get 10 12x14 pieces of colors and textures of Wissmach Glass that are great for creating spring scenes, April showers, May Flowers, pilgrims (they came on the MayFlowers) or anything else that puts a spring in your step. is a great companion for those who bought Techniglass' THE Grinder! We tested this glass on THE grinder and it works perfectly! Just kidding, we did not know what else to name it so we are riding their coattails. is a great making...ugh..stormy skies! Whether is a storm in Maine, Arizona, Alaska, or just a rainy night in your home town, this pack has got it covered. is a great for... Ok, I 'm not sure what this is good for. I let my employees name the pack. They got all excited when they saw the sparkles and the rainbows and blurted out the first thing that came to their minds. When you find a something this works for - let me know! Getting in Tune to the Straight and Narrow! After cutting up 100s of crates of glass for shipping, you tend to end up with some extra strips! We sorted and packed up hundreds of these straight strips into these great glass packs that are perfect for boxes, or in beveled panels, or making any type Frank Lloyd Wright or Prairie design. Each pack contains an assortment of straight strips approximately 2"x12" in size. An assortment of 12 strips containing various clear textured pieces. This pack is great for boxes, borders, mosaics or for having a lot of small pieces of various colors of glass for that time when you just need a small piece of something. 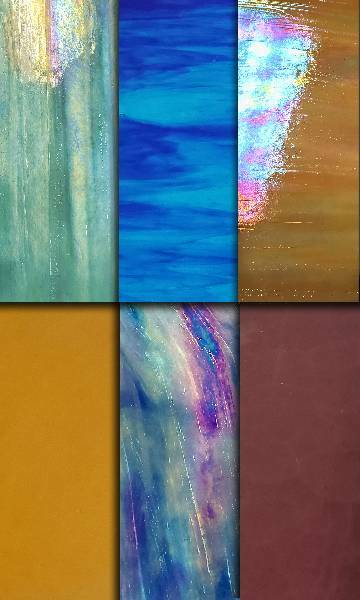 An assortment of 12 strips containing cathedral colors, opals and wispys. This pack is great for boxes, borders, mosaics or for having a lot of small pieces of various colors of glass for that time when you just need a small piece of something. Looking for Fusible Glass Packs?